I must have walked around it five times. I walked away from it, to get a good general view. I walked right up close to it, to feel its texture. I still can’t believe it’s real. But it’s there all right, in a clearing among the dark grey, sullen Stalin-era blocks of flats, miles away from the centre of St Petersburg. 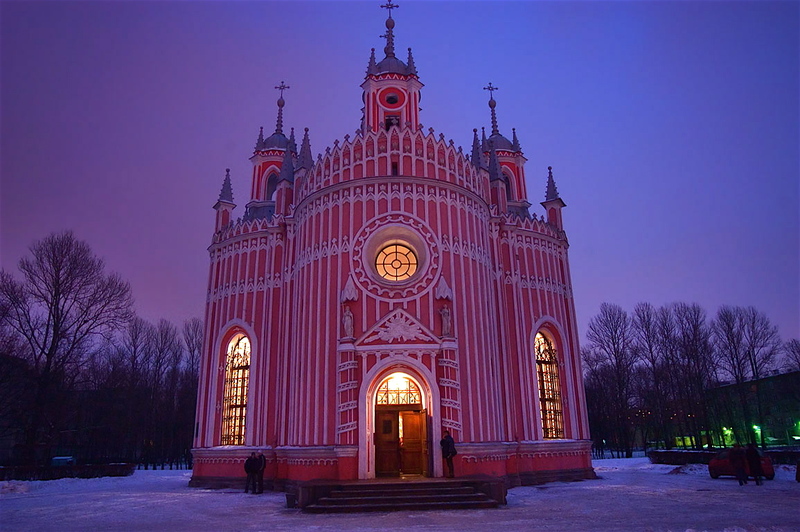 Raspberry pink with white trimmings, round like four barrels stuck together, spiky like the most flamboyant of gothic churches, forbidding with its tall, portcullis-like windows, yet sugary sweet like a wedding cake, it achieves this very Russian feat of reconciling the irreconcilable. I’m standing in front of Chesmeskaya church in the late February afternoon and too many degrees below zero, entranced by its icing and iron soaring upwards and curving outwards, wishing I could look inside the mind of the demented genius who designed it. It’s getting dark. All of a sudden, the lights come on inside the goth cake, first a flickering at the back, which I only see because it spills onto the bluish snow, then the front, all at once, and finally up in the bell towers. Its bijou size makes it look like the most outrageous doll’s house ever built. Two babushkas have appeared from nowhere, bowed at the front door, and walked in. I hadn’t dared come in on my own, but now I simply have to. It’s not bigger on the inside, quite the opposite, but I do feel like I have travelled back through time. It’s partly the smell that does it, a mixture of the wax from those tall, thin yellow candles they burn whole forests of on wrought iron stands, and incense. Then it’s the eternal, indestructible babushkas, the irascible but unwavering pillars society is resting on. There’s many more already inside, scuttling about in a flurry of flowery headscarves, dark coats and snow boots. It appears this particular edifice would also crumble without them. Who’d change the flowers, clean the floor, wipe down the icons, tread on your feet, carry wicker baskets full of bread rolls, restock the displays of portable icons for sale, and push you out of their way, if not them? They mean no harm by it, and despite their bowing and crossing themselves, they’re no mystics, thoroughly at home here, the familiar genies of the place, purposeful, each knowing exactly what to do, whispering in each other’s ear, suddenly plonking themselves down on the three or four chairs available. There are no benches in Orthodox churches, everyone stands or roams around, regardless of age. But these ladies survived the siege of Leningrad and do not care for such trifles. I feel so tremendously out of place, like I’m seven feet tall and have sprouted ten heads. I try to make myself unobtrusive in a corner at the back, which is of course precisely where one of the babushkas left her basket, and she needs it back right now, and I nearly tread on it, but it’s fine somehow. She said something half grumbling and half laughing that I didn’t catch. Just standing there while simultaneously getting underfoot takes some doing but I seem to manage. It appears to be completely normal to them. More people have come in, young women and men, several middle-aged ladies in fur coats of various startling colours. There’s a low hum of conversation, more candles are lit, icons are bowed to and kissed three times in quick succession. Since I’m not bothering anyone, I shuffle around a bit, taking closer looks and the indifferent wall paintings and gorgeous silver and gold frames, observing the varying degrees of devotion ranging from bored but obedient husband to anxious young lady obviously asking for a special favour…The cloud of dusty smell is going to my head, I’m floating as if in amniotic liquid. It took me quite a few seconds to realize the doors of the iconostasis had been flung open, and when I did it was too late, a procession of priests holding up icons and swinging huge incense burners was already snaking around the small crowd chanting, immediately joined in by everyone. Way to get myself caught out and expected to sing vespers in Old Slavonic! Lulled into a false sense of security by the warmth and candlelight and soft rumble and chirrup of Russian voices, I have utterly failed to notice the obvious fact that these people have come down here for a reason, it’s 7pm on Saturday, and it’s mass. Edging along the porous apricot plaster of the back wall, I find the entrance hall and back slowly up until I feel the massive double doors hard against my back. The freezing draught further dissipates the incense fumes as I slide back outside and into an indigo night lit by the sharpest, coldest stars. I cast myself out really, in a moment of slight panic, when I could have stayed inside in the heat. But then maybe I like being outside looking in, within reach of the glow, passing through, and on to the next place. Murielle has lived in London and St Petersburg, and is (for now) in Paris. Trained in film production, design and scenic painting, she spent the last ten years being a jack of all trades with variously successful results but no regrets whatsoever. She has now forced herself to narrow down her range of activites to travel writing and decorative painting. She enjoys cafés with outdoors tables, figure skating, and the smell of jet fuel in the morning.